This course is aimed at project management professionals in the building and construction industry who are interested in learning how to plan a project. The course is designed to precede a project scheduling software course such as Microsoft Project or Oracle Primavera P6. The course is presented in one day using a PowerPoint presentation and includes a workshops at the end of each module where the students practice preparing a number of planning documents. 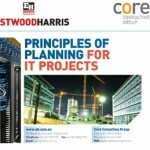 This course is aimed at project management professionals in the IT projects industry who are interested in learning how to plan an IT project. This course is aimed at project management professionals who wish to learn how set up and run an Earned Value Performance Measurement system. This course is very different to many other courses because it covers topics outside standards such as techniques needed to collect the EV data from existing corporate systems and alternative EV measurement parameters. Student notes may be printed form the PowerPoint slide show or the Student Handouts may be purchased using the link below. Student Notes may NOT be printed from the pdf of the Powerpoint slide show and the Student Handouts should be purchased using the link below.